The Pemberton Public Library would like to offer a Family Multicultural Storytime. This volunteer position would co-facilitate reading stories and singing song with librarian Nic. We are hoping to offer the Family Multicultural Storytime every second Saturday of each month from 10-10:30 a.m. We would like to rotate this position monthly so different community members can share their culture. If you would like to volunteer for this position please contact Anni at anni.kolbe@sscs.ca. Two years ago, Citizenship and Immigration Canada (CIC) announced that it would be taking over responsibility from the province for all settlement services funding in BC as of April 1, 2014. The high level of the Welcoming Communities funding from the province was, in part, a reaction to that – the original plan was to have 5 years of Welcoming Communities funding. What the change means is that all the ESLSAP (English as a Second Language Settlement Assistance Program), Welcoming Communities, and Settlement funding will now be under the auspices of CIC. In order to be able to apply for replacement funding, it was decided last year that a regional application covering Pemberton, Whistler, Squamish and the Sunshine Coast (Sea to Sky Sunshine Coast Welcome Net (SSSC Welcome Net)) would have a greater chance of funding, and, in the summer of 2013, Capilano University submitted an application for continued ESLSAP (Community Connections), Welcoming Communities and settlement programming funding in the region. In December 2013, we heard that this application had been accepted for negotiation and we have been working on this with the federal government since then. Intercultural Workshop Series starting Monday September 30th 10am-1pm! Come along and learn how to cook something you’ve never tried before, bring your friends! Exciting News for the PMN! 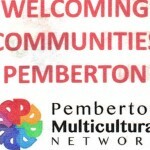 Pemberton Multicultural Network now has an Event Co-ordinator – Lynne Armstrong! Lynne Armstrong is originally from Scotland, she moved to Canada in 2011 and lives in Pemberton with her husband and 3 children. Lynne is an active community member and loves biking. Here’s a new opportunity for someone looking for a short-term part-time contract. If you’d like to get involved in organizing cultural events and activities, then this could be for you. Targeted intercultural workshop for your group or organization? Would your group or organization like to experience a different culture? Want to try out an art or craft? Or perhaps you’d like to learn how to cook food from other cultures? Or enjoy the music and dance from other countries? Whatever your interest why not contact the Pemberton Multicultural Network and work with them to develop a cultural workshop tailored for you. In addition to the series of intercultural workshops open to the public, the Pemberton Welcoming Communities project is planning to tailor events specifically for individual groups and organizations. Drawing on the skills and experiences of immigrants living and working in Pemberton, the Pemberton Multicultural Network (PMN) will work with your group/organization to put together a workshop specifically taking into account your needs and interests. Would you like to learn to cook different food? Or try a new sport? Sing international songs? Dance? Learn origami, or how to make a piñata? If you’re interested, call or email Carole Stretch on 604.698.7226 or cstretch@capilanou.ca for more information and to start the conversation.